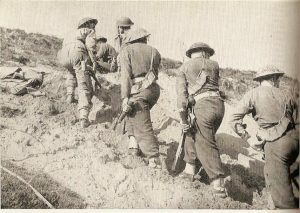 The London Irish Rifles maintained two front line battalions throughout the Second World War. A Young Soldiers’ (70th) Battalion was formed in England at the outbreak of war until it was disbanded in 1943. The London Irish Rifles At War, a history of the Regiment during 1939-45. Month by Month guide to the journey of the London Irish Rifles from 1942 to 1945. The 1st Battalion sailed from Liverpool to Iraq in August 1942, spending six months in the country before moving to Egypt in April 1943. They saw their first action in Sicily during July/August 1943 and then travelled to mainland Italy in October 1943 and fought throughout the Italian campaign, finishing their war time service near to Trieste in Northern Italy. The 2nd Battalion sailed from Greenock to Algeria in November 1942, before seeing their first action in Tunisia during December 1942 and were the first marching troops to enter Tunis in May 1943. The battalion were in action again in Sicily during July/August 1943 and then travelled to mainland Italy in September 1943 and fought throughout the Italian campaign, finishing their war time service in Southern Austria. A list of Honours and Awards gained by men of the two Battalions during the Second World War. A full Roll of Honour of all the men, who died while serving with the London Irish Rifles during the Second World War.